I’m not sure how you are currently keeping up with the news on golf, on The Open and on St Andrews. To be fair I don’t have much time lately to concentrate on professional golf so much but this week is special. Really special! It’s Open Championship week. Tomorrow on Thursday, there is the 144th tournament being declared under way and with it the 29th time of that event in the picturesque village of St Andrews, the home of golf. I’ve never been there, but the small town must be amazing. Everybody, really everybody is praising the mood in town, the people and the atmosphere on and off the track. And then there is this course, probably the oldest place on earth where a (sort of) golf ball was kicked around. This is where it all started, 600 hundred odd years ago. This is true history. Next year most definitely I will check out this place, inhale the decades of golfing past, walk the famous walks, play the unique holes and picture myself in history as well. I really can’t wait for this to happen. But before that there is the Open, this year’s 144th Open Championship; or the “British Open” how the Americans still tend to name it to avoid any confusion with their Open, the US Open. Whatever you call it, it’s a majestic tournament and this year the venue is the most majestic of all. This year will make history on it’s own and I can’t wait to see who’s gonna lift the claret jug into the breeze. It doesn’t matter really. In any case it will be special, be it a young gun or one of the veterans, a first timer or a “collector”. In either way this will again make history. There have been some very nice video being released recently which sum up the glory, the fame and the specialty of the tournament. These are worth watching. Are you ready for history? Anybody who’s not getting goosebumps watching this short trailer is either blind, cold hearted or never picked up the game. In any case you might want to reconsider as I sense there is history in the making at this year’s 2015 The Open at St Andrews. It’s major week, you know that. It’s 32°C here in Germany and I spend the Sunday in front of the TV. I believe you understand that as well. Rory McIlroy went into the final day with a 6-shot lead. Normally comfort enough to get the trophy home easily. This year Sergio Garcia plays very well at Royal Liverpool, Hoylake too. And also Marc Leishman, Adam Scott and Ricky Fowler play great golf. It’s 4 holes to go at The Open, Rory is still 2 shots ahead of Sergio but the pressure is there – for these both and for me as well: it’s really fun and exciting watching this Open Championship. Great golf ladies and gentlemen! The Open Sunday on Twitter – multitasking at its best! I was lucky I don’t have to earn my money with this golf blog. And I was happy I could watch the golf on the TV rather than on the laptop via a crappy live stream. So it went well for me. But I thought to myself, come on let’s do some proper golf broadcasting. Hence I made myself comfortable on the couch, TV in front, iPad, iPhone and MacBook in reach. And the rest of the day I was tweeting like hell, reading all that what other correspondents on-site were writing and tried to get into sort of a conversation. Not too much, I still wanted to enjoy the day but I started to realise it’s a quick game and one has to keep up with the pace of tweets coming through the wire. Nobody is interested in a missed put 10 minutes after it happened. During that time 50 others posted the same thing – with other comments, funnier jokes, or more cynicism in that fist seconds. You have to be quick! Continue reading The Open Sunday on Twitter – multitasking at its best! What a great Sunday it was, what a great tournament came to a stunning and thrilling end. I really watched tons of professional tournaments in my life and plenty of majors but these last 3 hours of the 2013 Open Championship in Muirfield really were outstanding and so much fun to watch. All eyes have been on Lee Westwood who was leading by 3 shots when he teed of today. The course is tough, weather was getting worse, wind came up and nobody expected many birdies throughout the day. Players like Hunter Mahan who was paired with Lee quickly lost some shots and was out of the equation. Same Tiger, he putted really badly, found many bunkers and struggled more than he has wished for. In the end all the eyes have been on Lee and Adam Scott. Then Stenson, the Swede, played brilliant golf and looked like the man who could make the outright lead. It was just not happening – but it was close. Suddenly another name was in focus; Ian Poulter. He scored eagle, birdie, birdie, birdie on consecutive holes and made his way up the leaderboard. He was fighting with everything he had and unfortunately struggled on the last holes to finish with a +1 for the tournament, five under for the day! At that point it was just Lee Westwood who was under par. But he began struggling as well, tee shots found bunkers or the deep rough, he needed two bunker shots or wasn’t sinking that important putt. In short, he tried to manage pars rather than birdies. One other guy instead played a hell of a round. Phil Mickelson played the golf of his career (as he later describes it). It’s a tough and challenging course, especially in such windy weather conditions, but he putted like an angel and ended his round with a remarkable 66 three under par. All he had to do is to wait for the others to finish but I assume he was really sure he made it by then. He and his caddie Bones started crying still on the green. What emotions! Phil scored big time with this important major! After the Masters wins and the PGA Championship titles this is the third major title he earns to reach the career grand slam. Only the US Open is something Phil is still waiting for – 6 times as the unlucky runner-up! Phil, his caddie and main man Bones and the Claret Jug… you guys really deserve it! Thanks for this thrilling afternoon! Anybody thanked the BBC yet?! Thursday and Friday I had busy days in the office and couldn’t keep up with The Open 2013 action in Muirfield. And to be honest I was afraid that the weekend would ruin a long awaited golf watching session. I’ve kept my calendar free for this event and originally wanted to be there on-site but in the end I thought to myself extreme-couching would be enough commitment to the only major on European soil. Problem with golf broadcasts is that normally pay-tv like SKY takes over (which I don’t subscribe to) and I was afraid of another weekend in front of my computer, looking constantly for a better stream, either because I’m not able to understand Arabic or because the picture and sound quality is so lame that “buffering” is the only thing to recognise. Only on Saturday I realised that the BBC airs the tournament in full lenght with everything you can dream of as a viewer on a couch, ready for the action on the course! Today was a classic golf day – if you prefer golf more than anything else and you appreciate a major tournament on TV as much as I do, then this Saturday would have been something for you I bet. Scotland has summer, that’s the first stunning thing to mention here. Really rare chance for the upcoming DVDs and BlueRays to be produced showing a major tournament staged in Scotland and you see sunshine, brown grass here and there and plenty of Brits with heavy sunburns wearing shorts and sunglasses in the background… that’s really something! I’ve never been to Muirfield but I believe people who say it’s a tough course. Looking at the scores thoughout the day there were not more than 5 guys in red numbers and the leader stands at -3 for the tournament after day 3. There were not many birdies out there – just the fight for them. I was watching TV most of the day, I saw Jimenez melting away with a +6, saw Tiger attack and lose, saw Garcia screaming and saw a superbly playing Lee Westwood, who took his chances and scored with unbroken braveness even after bad shots and great recoveries. Lee is really deserving this, never won a major, playing on top level for so many years now and I guess he is quite a nice guy… I cheer for him tomorrow!! I already cheered for him today, this Saturday felt so much like a Sunday – amazing!! Mahan, Woods, Scott and Moore, Johnson, Stenson, Cabrera – all these guys still have chances tomorrow. Someone will write history tomorrow, someone will succeed and will lift the Claret Jug into the Scottish air on the 18th tee. I can’t wait for tomorrow!! 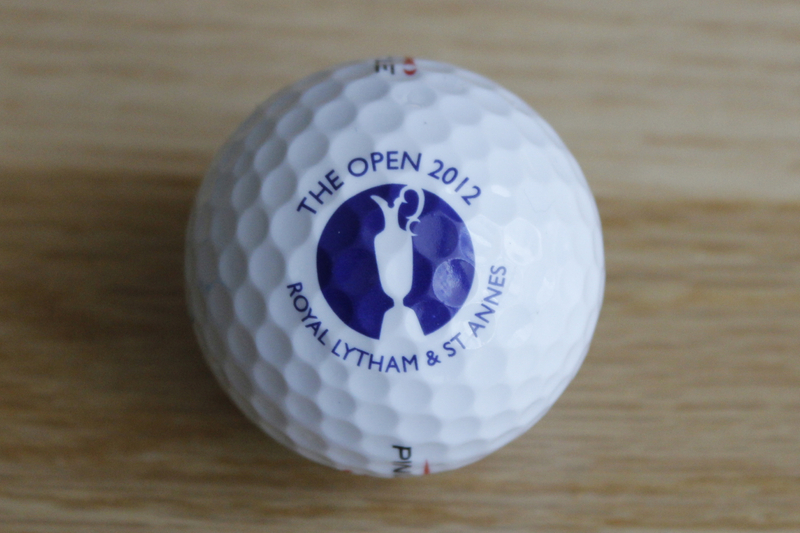 The Open 2012 aka British Open at Royal Lytham & St Annes has just finished one day ago and I thought this ball might be a valuable one to have in my showcase. Unfortunately I’ve never played the course and I doubt that I will in the near future but watching these guys on TV walking the links-like course with its over 200 pot bunkers, you’ll recognize it’s something special.